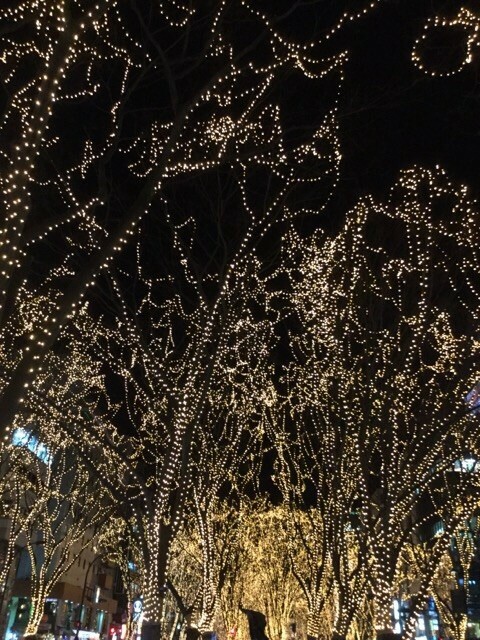 イルミネーションページェントは物凄い綺麗だった！/ The Christmas lights were very beautiful! The other day, I went to see the 'hikari no pageant'. In English, for 'hikari no pageant' we can say Christmas lights. This year's Christmas lights were also very beautiful! In Canada too, during the Christmas season you can see beautiful lights wherever you go. Looking at the lights while walking along Jozenji Street is very calming. However, I was thinking, isn't this year's pageant a little different? This year's pageant has a beer garden! This is the first year there has been a beer garden, isn't it? (Was there one last year?... I forget!) Anyway, having a beer garden is even better. The other day, I was looking at the lights while drinking beer and I really enjoyed myself. I really love living in Sendai. I especially like the festivals and events, they are really wonderful I think. In Sendai, we have interesting events in spring, summer, autumn and winter. I think this is really good for all those who live here. Compared to other big cities such as Tokyo and Osaka, Sendai is relativley small. However, there is a lot of green and there are many interesting events, so I think Sendai is a great place to live.